It’s an inevitable fact of life that spam exists and that it can sometimes become a major annoyance and sometimes really embarrassing too. There are so many email schemes going on right now and I wanted to write an article covering some of the ways to identify if the email is genuine or not. Many spam emails have something in common; they want you to carry out an action, whether that be to click on a link, to open an attachment, to view an image, to call a number or perhaps to send a payment via Bitcoin. If you’re in any doubt as to where the email has come from DO NOT display any embedded images, open any attachments, click on any embedded links, ring any numbers or send any online payments. If you receive spam from what seems to be a genuine company such as Vodafone or perhaps Plus.net or BT.com, the first thing to consider is do you have an account with them already? If the answer is “yes” then we can move on to the next step. If the answer is “no” then its likely that you can ignore the message and delete it if its not useful to you. Look at the FROM address and see if it looks familiar or that the bit after the @ sign is genuine. So for example, you might get an email from sales@vodafone.co.uk. If your Vodafone email comes from anyone other than a Vodafone address, then its likely going to be some kind of spam. I say likely as some legitimate companies will use a third party to deliver their marketing email. If in doubt, delete it. If the FROM address looks correct then look at the copy of the email and see if there are any links present. If there are, don’t click on them, but if you hover your mouse cursor over the link, in many email programs it will show you the real address that you’ll be visiting and if this looks dodgy, don’t click on it! On a mobile device its a little different as you cannot hover your mouse, but I’ve founds that if you press and hold on a link on an Android or iOS device, it will give you options such as how you wish to open the link. Its at this stage that you can look at the link before really “clicking” on it to determine if it looks legitimate or not. If it looks dodgy, close the window and delete the email. Are there any obvious grammatical or spelling errors? If there are then this should be ringing alarm bells. Any legitimate company should be spell and grammar checking their emails before they are sent out to 100,000s of people. Heres a good example. 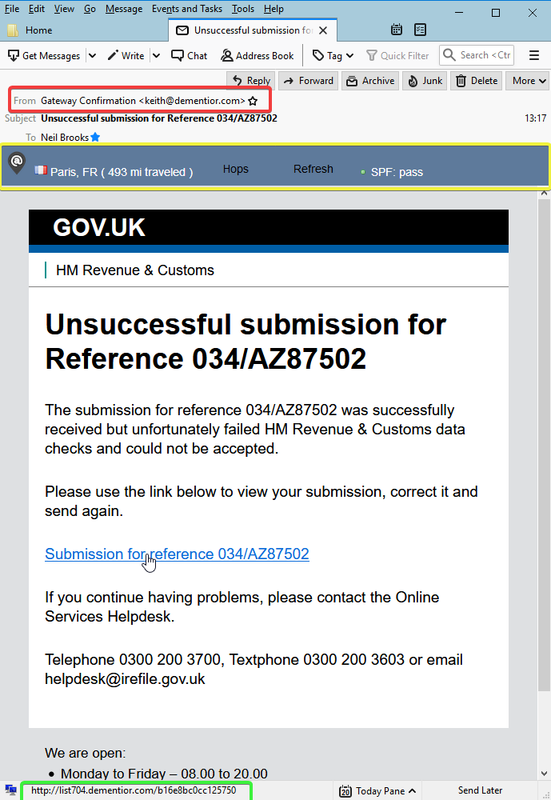 I recently received an email allegedly from Gov.uk regarding an unsuccessful tax submission. The email below itself looks quite professional, but the FROM address (marked with a red box) is not an address I’d expect this email to come from so my spidey sense is tingling. On closer inspection, when I hover (not click) on the blue text link, the address (marked in a green box at the bottom) is certainly not an address I’d expect a valid gov.uk email to use. The more astute among you will also notice some other interesting things in the image, namely that theres a bar running along the top (marked with a yellow box) mentioning “Paris”. This is displayed as I have a plugin which aims to tell me whereabouts an email has come from based on some invisible data within the email. Whilst this is not 100% accurate all the time, it does help with flagging emails that may not be genuine. This plugin is called “MailHops” for Mozilla Thunderbird, a really good email program from the same people who make the Firefox browser. So adding all the evidence up, its incredibly likely that even if I would expect to get an email from gov.uk regarding the submission of taxes, this specific email is not genuine and it can been sent to the bin. I recall with fondness the very first time me and my sister received our first computer one Christmas Day in 1983. It was a Commodore 64 which came with one game called Cybertron Mission. within 10 minutes we had the computer all set up on the TV and were playing the game. When I reminisce about playing Cybertron Mission, a warm, vague mist descends and my memory tells me that the game was amazing with full colour graphics and 3 channel sound. That feeling, more than the actual game itself is why I love retro games, after all many retro games let’s be honest are actually truly awful by today’s standards. In the case of the Commodore 64, there was the delicious but agonising wait to save up enough pocket money to buy a new cassette from the local store. Then when you had the game in your possession it may have still taken many minutes to finally load into the computers memory. Ah the good old Commodore Datasette. 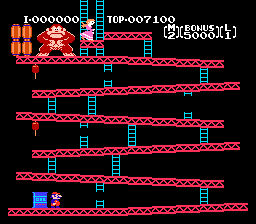 These days you can now emulate many old computer systems, such as the Commodore 64, Spectrum 48k, Amiga, Atari, even some of the more modern consoles such as the Wii and N64 can be readily emulated on modest modern computer hardware. If the thought of retro games still gives you goosebumps, take a look at a project called retropie which uses a relatively inexpensive raspberry pi computer to emulate a whole range of old computer and gaming systems. Relive your mis-spent youth waggling your joystick to Daily Thompson’s Decathlon, or smashing the fire buttons on Galaga knowing that you’ll never need to insert an old 10p into the slot ever again. Watch out for a future article where we will look into retropie in more depth, go through the install process and set up a retro arcade cabinet. NAS stands for Network Attached Storage. In other words some storage that is connected to your wired or WiFi network at home or in the office. A NAS device is a dedicated mini computer consisting of one or more hard drives which are then set up so that your PCs, Apple Macs, iPhones and Android devices can see the space, save stuff to them and also pull stuff from them. NAS devices for the home tend to be relatively small and quiet devices that sip power and are designed to run 24 hours a day, whereas large offices might have bigger devices mounted in specialist racks. NAS devices can store any kind of file that you might store on a computer or mobile device and are ideal for use as backup devices when set up correctly, offering peace of mind if something goes wrong with your computer. There are many makes and model size of NAS to fit all budgets. 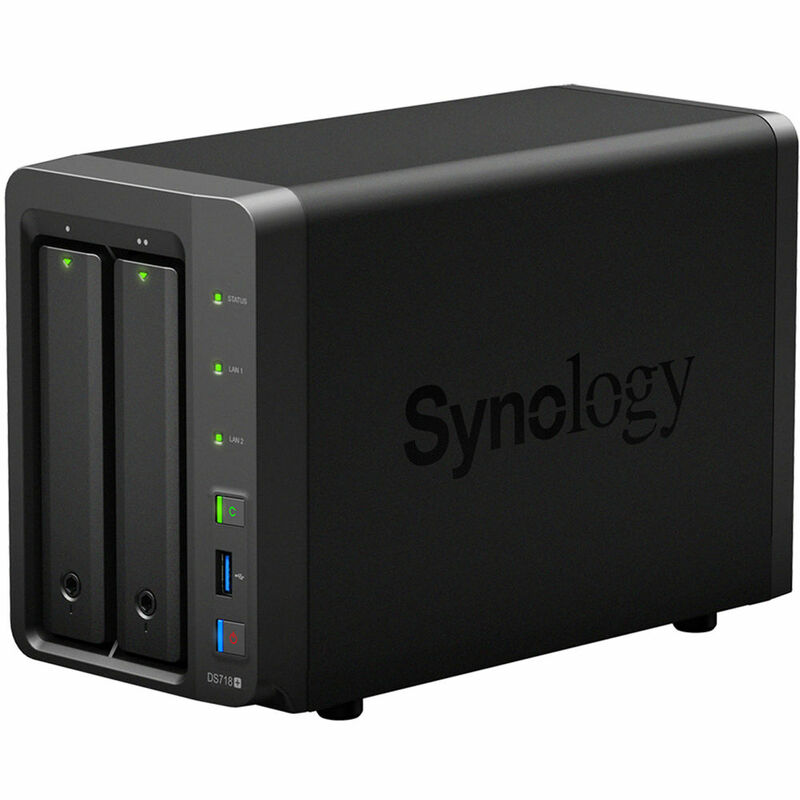 The Synology devices are some of our favourites as they tend to come with lots of additional software that you can install, much of it is free to enhance the capabilities of the NAS from a simple storage device to a complex security camera recording system for example. There is another device type called SAN which might seem the same as a NAS at first glance, however SANs tend to be used in enterprise environments and operate in a different way. You’re sat waiting for your ageing PC or Apple Mac to boot, thinking “maybe its time to buy another one?”. You can pick up a new PC for less than £200… with an operating system, which seems crazy cheap but in this age of throw away tech, it seems to be the way that most manufacturers are moving. Even the high end MacBook Pro laptops are not built as well as you might think, but their price point suggests otherwise. What if you could repurpose your old laptop, PC or Apple Mac to be as fast as the day it were born? There is no special magic or sauce here. No clever dongle that promises to boost the speed of all the components on board. The potential solution comes from something called Linux. You may have heard of Linux or perhaps Ubuntu. Linux is another Operating system, just like Mac OS or Windows. The difference is that most Linux distributions (we call them distros) are free to download and install. They come with a raft of tools to rival many Microsoft or Apple software and if installed correctly, Linux can provide a boost of speed and give new purpose to an otherwise perfectly good but ageing computer. Now, lets be clear, you’re not going to get Microsoft Internet Explorer or Edge. Your not going to get Word, Excel, Powerpoint or Outlook on Linux (at least not yet), but you can get some very good alternatives such as Libre Office for your Office siute replacement, Mozilla Firefox or Chromium to replace Internet Explorer/Edge and Mozilla Thunderbird to replace Outlook for email, making this a perfectly useable internet ready PC once more. If you’re confident to have a go at installing Linux yourself, then head over to https://www.ubuntu.com/#download and download the desktop version yourself. However if you would like to discuss this further, drop us a line and we can provide a personalised quotation for installing a new Linux operating system and all the software you may need. One of the most common issues I encounter when fixing a computer is the lack of regular backup. If the computer that I’m asked to fix has a faulty Hard Disk Drive or SSD, then its likely that some/all data on that drive will be lost… forever. There are some software tricks we can employ to try and get the data, but if the disk itself simply will not start, then recovery of important thinsg such as family photos, important documents, emails, family videos etc. is increasingly slim and also increasingly expensive, running into £1000s to send the disk away to a special dust free laboratory where engineers will try (and there are no guarantees) to recover as much data as they can. 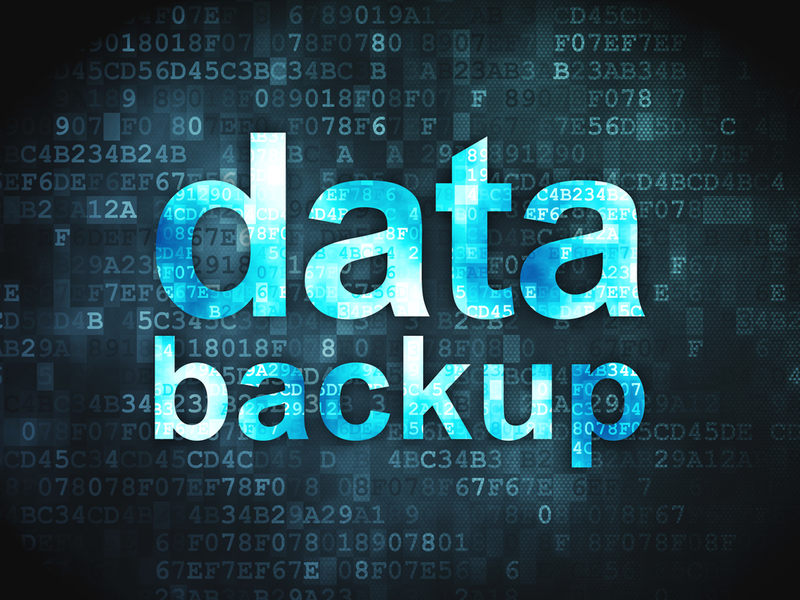 These days, there really isn’t any excuse not to have some kind of backup in place, whether thats a second USB Hard Disk that you plug in each week or month, or perhaps an online solution such as our own Cloud backup solution, Dropbox, Google Drive, Microsofts OneDrive, or even perhaps whats called a NAS (Network Attached Storage is an unassuming box of disks that acts as a kind of central repository for all your backup files across all your devices). I’ll talk about NAS boxes and options in a future Blog entry. Many of the online solutions (including own own) provide some free space to start you off. If you already subscribe to Microsofts own Office 365, you’ll have 1TB (1 Terabyte or 1000 Gigabyes) of online storage included, so what are you waiting for? Don’t put off setting up a backup until its too late. Thats actually quite a daunting list but according to tools online such as http://random-ize.com/how-long-to-hack-pass/ my newly created password that fits all the above criteria might take 420,805,123,888,006 years and 6 months to crack. Thats a long long time but even thats not stricty accurate and I may discuss this in a future blog article, but simply mention “Moores Law” or more the death of Moores Law and the advent of Quantum Computing. As a comparison the password “password” can be guessed within 1 minute and 13 seconds, and thats if the computer doing the guessing isn’t cycling through commonly used passwords first. 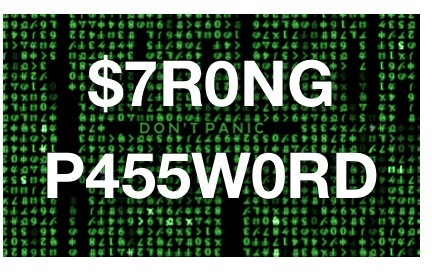 If we consider that the only way we’re likely to remember these passwords is to use a piece of software such as a bespoke password manager, or even the web browser itself as many of them offer the ability to remember passswords or perhaps spreadsheet then ideally we should also be password protecting this source too, in case our computer gets hacked and vital data is exposed to the hacker. We could write them all down on a piece of paper and file that away, however my writing is atrocious and did I write a “1” or an “l”, a “O” or a “0”. The more pressing issue is remembering all these passwords for each and every service. If we were to follow the above 5 points then I expect that we would be continually requesting password reminders. But is that really such a bad thing? After all if we’re asking for a password reset every time we need to log in, we’re potentially fulfilling point 5 while of course fulfilling all the other points as well?